EAST HARLEM — Joseph McGinley traded a needle for a paint brush. McGinley, who has gone three months without using heroin, credits part of his ongoing recovery to art. His first project was turning a photo of his son Brendan into metal buttons. His next project will be a painted portrait of Brendan. “She’s going to go nuts,” he said, flashing a smile that reveals a few missing teeth. McGinley's work is featured in an art gallery at the Odyssey House drug-treatment center on 239 E. 121st St., along with a few dozen artists who have mental health conditions or are recovering from drug and alcohol addictions. Art often helps recovering addicts open up about their struggles after keeping them secret for so long, said Jerald Frampton, the expressive arts coordinator for Odyssey House. “You don’t tell your boss. You can’t tell your wife. You’re stealing money from your brother. But when you’re working in the art program, you don’t have to lie about anything. You’re open and you’re working with other people,” Frampton explained. The art gallery, which opened to the public last week, is located within Odyssey House's facility that provides permanent housing for homeless people with disabilities. Frampton and Odyssey House have been putting together art exhibits for years, featuring different themes like identity, childhood memories and dreams. This year’s theme was family. Among the featured work is a large piece done by several artists, including McGinley and Learie Jhudeo, 24, of East New York. Working on the project helped them come to terms with their situation and find ways of overcoming their challenges, they said. In the art world, a gallery like this is considered “outsider art,” a term coined in the '70s to describe works by artists with no formal training. Today, New York's Outsider Art Fair features artists have gone on to sell their pieces for as much as $750,000. “This artwork is not as conventional as what a trained artist would do,” Frampton said. “You might go see work by artists, and it’s wonderful and you enjoy it, but with this there are all kinds of surprises, because by not having the same fine arts education, they don’t have the same references. I’m so surprised every day by what people are doing." 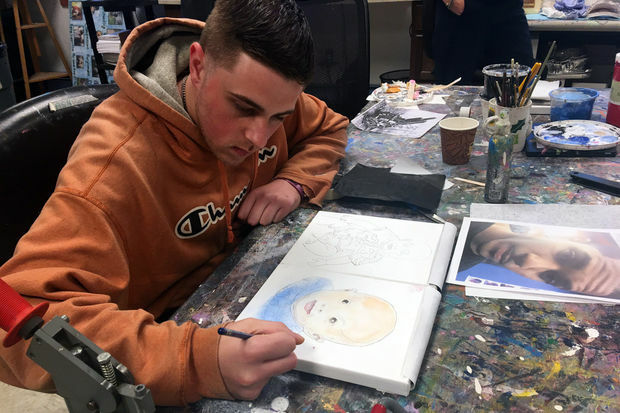 In terms of staying in treatment, art can help recovering addicts find a new purpose and new ways of spending their time, explained Odyssey House CEO Peter Provet. “For us, the most important thing about the project is that it helps people stay in treatment,” he said. McGinley was prescribed Percocet after hurting his shoulder during a pick-up football game when he was 19. From there, he took higher and higher doses, resorting to buying pills on the street until that became too expensive and he turned to heroin. Because his tolerance is lower now, McGinley risks an overdose if he uses heroin again. Every day, 91 Americans die from an opioid overdose, according to the Centers for Disease Control and Prevention. McGinley's son and the memory of his mother, who died two years ago, are what motivates him to stay sober.